A week or so ago, I went scouting for a location to run a short mini-expedition. In attendance were some of my regular bigfooting buddies and some guests. Toby Johnson, organizer of the Oregon Sasquatch Symposium, came up from Eugene, OR with his son, Jude for a night in the woods with us. There was also a film student from Portland Art Institute filming the trip with his sound technician for a school project. We all met at a coffee shop in Estacada, OR at noon. Once everyone arrived, we started down the Clackamas River Highway towards Ripplebrook Ranger Station. There were two large herds of deer sighted just north of Ripplebrook in the last couple weeks, and large deer herds are amongst the best indicators of the possible presence of sasquatches. 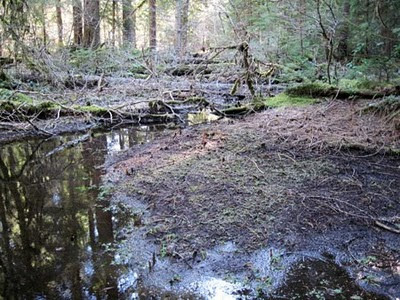 The target area for this expedition was a large swamp along the Clackamas River. I wanted to check out the swamp for prints. 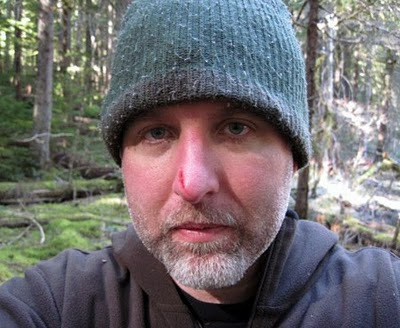 This was not only to give the guys something to film, but also to find out what kind of animals were walking around in the bottoms this time of year. After turning off the main highway and into the woods, we found a site that could accommodate our four vehicles with a fire ring. It was hardly more than a pull-out, but behind some nearby boulders and tree stumps there was a forested path that led downwards into the swampy bottom lands. Disused trails of both human an animal origin snaked off into the woods on all sides, though only for a short distance before the surrounding foliage swallowed all trace of them. It was a perfect area to sleep in: sasquatches could approach from nearly any direction and still have plenty of cover to hide in. We pitched several tents separated by 75 or 100 yards. Two members of the expedition chose to sleep outside under shelters made only with natural materials, cool tarps, and fancy knots. 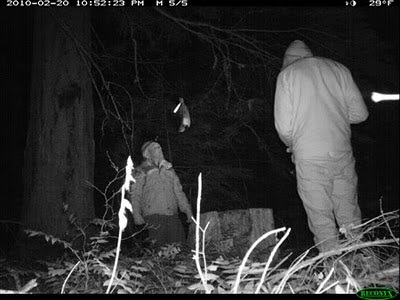 To help the sasquatches be curious enough to come in for a look, we hung several attractants nearby. Toby brought glow sticks, which he tied to apples and hung in trees across the road from our camp. 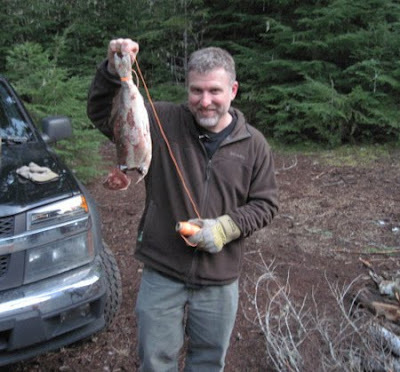 We tied another to a dead shad and hung them both in a tree near our tents. Aimed at the fish was a heavily camouflaged Reconyx RC60 game camera. Cliff, an eerily illuminated shad, and Jesse the Film Guy much later that night. With a few more hours of daylight still available, we went for an off-trail hike through the marshes. Being winter, the formidable Devil's Club (Opolopanax horridum) had gone dormant and exposed the water's edge leaving plenty of mud, sand, and other substrate in which to record tracks. There were indeed many prints of deer and elk, but none of sasquatches. I will definitely make it a point to wander through here again soon. Considering how little of the forest floor actually records footprints at all, this seems like a promising area in which to stumble across some. The marsh offered excellent substrate for tracks. The night was spent knocking, calling, and walking. The acoustics were surprisingly good, and our calls could be heard echoing great distances up the canyon. They were easily heard back at camp and made poor 7-year old Jude a little unsettled. It is interesting to note that our knocks were not heard back at camp, though they seemed plenty loud at the time. This was the case on every walk we took that night: the knocks were absorbed by the trees. The only vocalization heard was that of a barred owl. It spontaneously called only once and would not respond to our noises. Having stayed out late the night before celebrating a friend's birthday, I started getting a little tired sometime after one o'clock. Besides, the temperature was 27 degrees and a warm sleeping bag sounded pretty good at that point. Saying goodnight to the others, I walked off into the dark to find where I pitched my tent. Lying down, I zipped up my sleeping bag nice and high and listened to the forest noises until I dozed off. The film students left during the night because they were were a little unprepared for the cold, Toby took off at 3:30 am to drive to the coast for a geology class, and the rest of us went our separate ways before noon. On our way out, two friends and I walked in the swamp one last time before driving back to Portland. I found that fresh deer footprints from the night before crossed the tracks I had left on the previous hike. I think this place will be teeming with game (and mosquitoes) in a few short months as spring gets a hold of things and food becomes more available. This area gets some human traffic when the weather starts warming up a bit, but very few people walk the swamps. No human trails nor trash was found on either of my hikes into the marsh. I think the vast majority of people stick to the roads and don't drop down into the bottom lands. Of course, there's a reason for that. It's not easy going down in the thickets. There is deep mud, thick mossy quagmires, and entangling bushes with pointy parts that gouge out chunks of flesh from your nose. Still, that's bigfooting, and I love it. I'm curious, do you think that going scouting in such a large group of people makes it less-likely that you will run into a Sasquatch? I've never been so, I really don't know about these kinds of things. But, it seems to me that they would easily detect the presence of a large group of people...at least more so than if you were in groups of 2 or 3 at the most. Someday when I have the time and finances, I'd love to go on a month-long expedition. 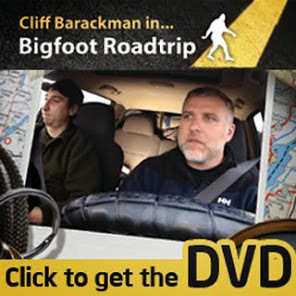 Do Sasquatch follow regular trails or migration patterns like other animals in the forests? Most close encounters are felt by one two or three people from what I have researched Cliff. SOLO does best. I don't have local people interested enough to team up with me so I go solo yet all I've found so far is log and stick structures and some humanoid tracks. My site #1 has been abandoned since last Summer by Squatch but I await his return since I believe he is a nomadic seasonal visitor. There are more deer in this place then you can shake a stick at. It is nothing to raise 12/15 deer just walking in and out and it is far from humanity.